The printing press invented in the 15th century by German artisan Johannes Gutenberg was a pivotal discovery for humanity. With it, works that were then only handwritten could be mechanically printed and reproduced. This invention ensured that printed works could reach wider crowds. This was a breakthrough in terms of both communication and education and bore radical results. The invention of the printing press became the most important milestone of modern times. Printed books became the medium that transferred human experience and expertise to new generations. Libraries and archives hosting printed works and records quickly became integral parts of civilization. Once the presses were mass produced, libraries became public spaces and institutions that required systematic organization. In the modern age, central and local administrations have embraced establishing and managing education, science and culture institutions and libraries. While the digitalization of recordings and archives are slowly taking the place of their physical versions, libraries still continue to be institutions that prove expertise, knowledge and cultural history. According to reports and official data, the Library of Congress in the U.S. has the largest collection in the world. The library, considered a state archive, includes a copy of any printed work printed and published in the country and hosts more than 167 million written works. There are more than 39 million books and other printed materials, 3.6 million visual and audio recordings, 14.8 million photographs, 8.1 million sheets of music and 72 million hand-written works in the collection. If lined up end to end, the library's book shelves would be an impressive 1,348 kilometers long. The oldest federal institution in the country, the library was built in 1800 and the Capital Building containing the library was destroyed in a fire in 1814. As a result, 3,000 pieces, forming the first core of the library, were destroyed. The next year, Congress purchased the personal library of Thomas Jefferson, one of the founding leaders, of 6,487 books and rebuilt the library. The British national library, the British Library, is the second-largest library in the world with a collection containing more than 150 million works. Established in 1753 per order of Carl II George as a part of the British Museum and separated from it via a law that came into force in 1972, the British Library hosts handwritten works, maps, copies of newspapers and magazines, drawings, music notes, audio recordings and patent documents. There is also an 8-million-piece stamp collection at the library. The library's book shelves' length exceeds 625 kilometers and 12 kilometers of shelves are built for the 3 million books added to the collection each year. 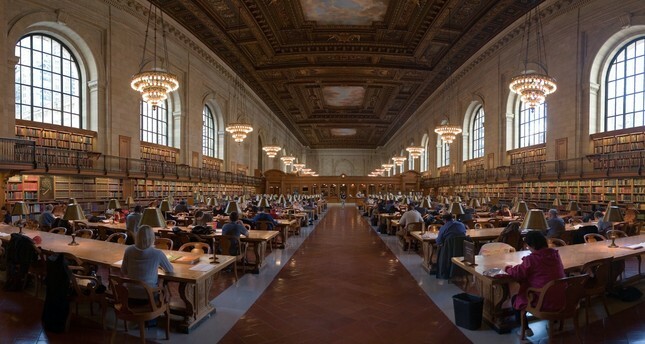 Built in 1985, New York Public Library, the largest urban library in the world, hosts a collection of 55 million books. With headquarters located in an iconic building on 42nd Street in downtown New York, the library serves approximately 17 million people a year with its three research centers and 88 neighborhood branches. Established as Dominion Archives in 1872 when Canada was ruled by the U.K., the official archive was named the Public Archives of Canada in 1912 and then changed into the National Archives of Canada in 1987. The archive was integrated into the National Library of Canada, established in 1953, in 2004. Hosting a collection of 54 million pieces, the mission of this new institution is "to preserve the documentary heritage of Canada for the benefit of present and future generations." The Russian State Library, considered the "state archives" of Russia, hosts 43 million books and archival materials. Containing documents in 247 languages, the library opened its doors in 1862 and contains special maps, music, voice recordings, rare works and a collection of scientific dissertations. Japan's National Diet Library was established as the heir of three libraries, the library of the House of Peers, the library of the House of Representatives and the Imperial Library. On the entrance wall of the library, which hosts more than 41 million works, it is written the "Truth Sets You Free" in Japanese and Greek. The mission of the library is described as "providing the right resources that will guide policy makers in public policies." Dating back to a handwritten manuscript collection of King George V in the 14th century from the Louvre Museum, the National Library of France is one of the largest libraries in the world with 40 million works. Located in Paris, the library has moved to its 4-winged modern building named Francois Mitterrand Library from its historical building in Richelieu in 1996. The library hosts a large collection of medieval and modern handwritten manuscripts. The archives include medieval manuscripts, knight novels, Eastern literature, religious texts, antique history, the history of sciences as well as the notebooks, handwritten notes and letters of famous figures such as Blaise Pascal, Denis Diderot, Guillaume Apollinaire, Marcel Proust, Sidonie-Gabrielle Colette (known simply as Colette) and Jean-Paul Sartre. Located in St. Petersburg, Russia, the National Library of Russia hosts more than 36 million works. The library is the second-largest library in the country after the Russian State Library and was established by Czarina Katerina in 1895. The core of the library is from the first public library of Europe, Zaluski Library, established by a Catholic priest, Jozef Andrzej Zaluski, in Poland, later invaded by the Russians in 1794. The 420,000-piece collection in European languages set the stage for the Russian Enlightenment in the 19th century. Established within the scope of westernization reforms by the Qing Dynasty in 1909, the Chinese National Library was first established as the Beijing Empire Library. After the Ching Dynasty was toppled and the Chinese Republic was established in 1911, the library was opened for service in 1912 and still continues to serve the public today. Along with Chinese ancient books and manuscripts, there are rare pieces, such as bones and shells from the Shang Dynasty that were used for fortunetelling, reflecting a mystical outlook on life. Hosting more than 33 million pieces, the National Library of Spain contains handwritten manuscripts, printed works and other records from a geography that spans from Latin America to the Indian Ocean of countries speaking Spanish, one of the most widespread languages in the world.